I have been looking at measuring the PAR levels in my tank from the light. Does anyone know where you can rent them? 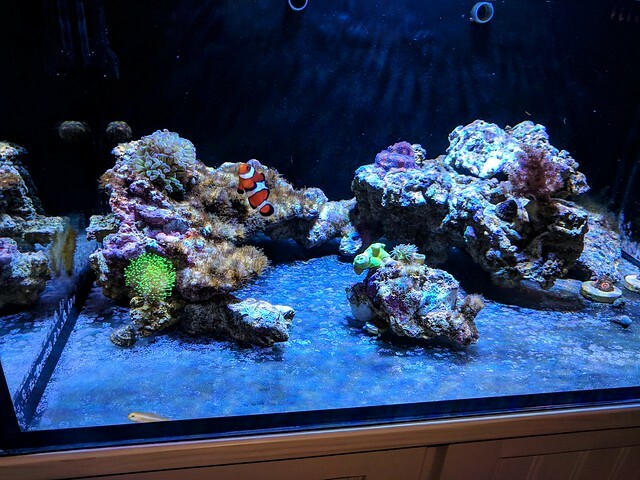 Any reefers here have one laying around they could lend? Can't see any reason to buy one for the minimal use it will get. Noticed today my Trochus snails spawning. Water was all cloudy. Really fun to watch. Hoping some little ones appear. Did some research and I don't think it has any negative impact on the water quality? Also a month back I noticed what appeared to be a few tiny mysis shrimp hanging out under a rock in the DT. Now there are easily 20+ little mysis cruising around and picking up ditritus and bringing it back to a colony. Like ants. Very fun to watch these little ones cruise around and work haha. My amphipod population has exploded as well. Fun with bare bottom tank watching these critters running around under the rocks. So have been dealing with bryopsis lately. I have my nitrates and phosphates both testing at 0. 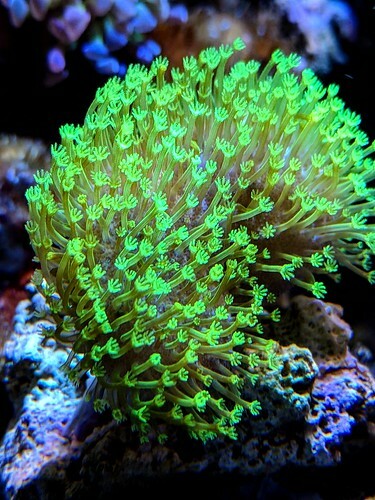 Which I am certain is leading to some color fade in my corals. Most noticeably the SPS. I have been physically removing it and I think I have it under control. I also have some red algae, which looks like a macro algae that is growing on the rocks. Which is collecting some kind of other algea and looking brownish. You can see it on the photo below on the single rock on the left side. On a side note....water and electricity don't mix. 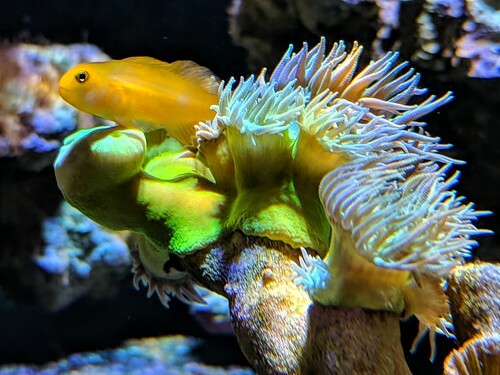 I electricuted myself during a water change. Long story short, I spilt some salt water on the power extension cord that I had my return pump plugged into. When I was done, I went to unplug the pump and bam.. electricity started flowing through me. Could hear it in my ear! I managed to let go and stumble backwards. It sure woke me up! Thankful I didn't have any body part in water at the time! In ally years of owning an aquarium..this has never happened to me before. 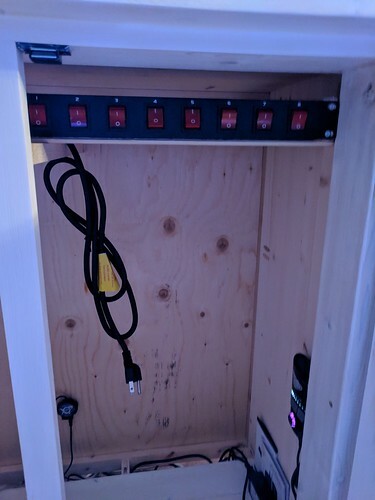 I decided to learn from this and order a new server rack 8-channel switch. And will have this mounted up in the top part of the stand. This way I can control the power that runs to the pump that returns the new water to the tank. Lesson learned. Last edited by Synthesis; 02-06-2019 at 03:06 AM. So its been a while since I posted an update. A lot has happened. First, I installed the power bank in an attempt to save my life in the future. It fit better then I thought it would. This has made water changes so much easier. Not sure why I hesitated to get something like this. Cost me 54$ with shipping for this. Worth every penny. 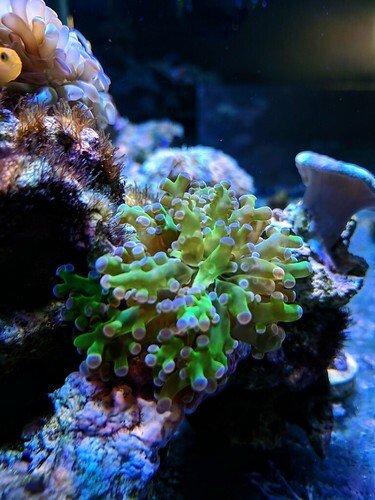 All my other corals are doing well. Trying to manage some algae which has been a challenge yet my phosphates and nitrates are undetectable. I have also been trying to get my parameters in check lately as my tank seems to be consuming alot of alkalinity. Calcium and Mag are fine but I am having to dose alk daily at about 2ml (red sea pro foundation alk) a day right now to maintain 9dkh. But its much better then before when it was reading 5dkh before I started clueing in on it. Funny enough, other then some coloration with my SPS...all the livestock was fine. But still, felt like an amateur not staying ontop of the params like I should have. Did you kill all the byropsis? Fluconzole for bryopsis, pretty straight forward on how to use it. Save yourself some grief and give it a try, should work wonders.